When mysterious spacecraft touch down across the globe, an elite team—lead by expert linguist Louise Banks (Amy Adams)—are brought together to investigate. As mankind teeters on the verge of global war, Banks and the team race against time for answers—and to find them, she will take a chance that could threaten her life, and quite possibly humanity. Before watching Arrival, I thought I had enough of sci-fi films, I meant sci-fi films involving outer-space, hostile aliens and the earth under attack. Gravity was good and The Martian was exciting, but when you see aliens attacking from Battleship to Independence Day: Resurgence, I couldn’t help but subconsciously judge this film, wincing inwardly having to go through yet another “alien invasion”. which I don’t have to watch to know the outcome – human defeat aliens and they live happy after. Instead of the violent action film everyone is assuming it to be, Arrival is a film unlike anything else I’ve seen in recent years. It is an introspective, sophisticated art-house film using big Hollywood actors – The Lois Lane Amy Adams and Hawkeye Jeremy Renner to catch your attention (at least it did catch my attention). 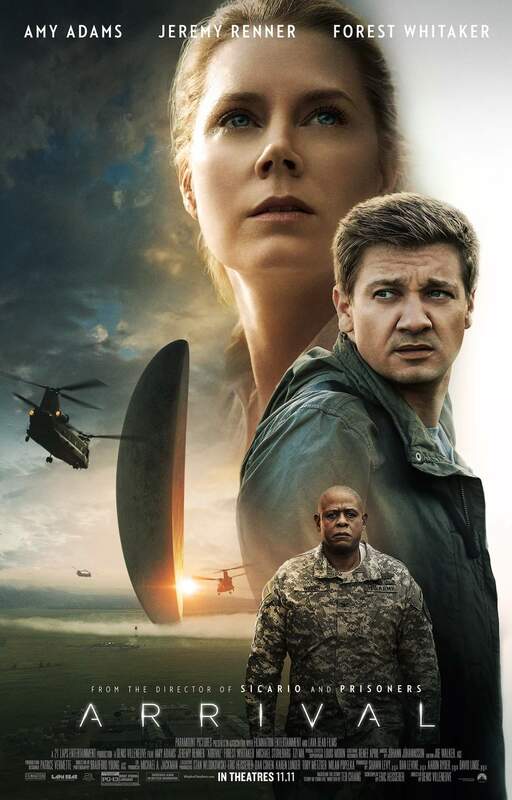 The film focused on expert linguist Louise Banks (Amy Adams) who was thrown into a military mission when 12 unidentified flying objects enter Earth’s orbit, and how she tried to identify the reason these aliens arrive to Earth. Subdued with a dark story in her life, Louise is a character with depth. She is intelligent, strong and very real. She did not try to be a feminist, neither was she a weakling. Her passion in linguistics and her patience in trying to communicate with these foreign beings made me find the missing piece of puzzle in many “alien-invasion” films, especially the recent Independence Day: Resurgence. Despite the massive invasion project, the film has a relative small team being focused on screen. This is relative of the message the director wish to express. Look inward rather than outward. Ian Donnelly (Jeremy Renner), a military scientist who was also roped into the team for his knowledge, played an (almost supporting) main role. Instead of trying to outshine, Jeremy Renner provided some balance by adding light humour to the otherwise solemn film, with some stereotypical masculinity. I like how the film presented the gigantic problem (of an alien invasion) on a single story from Louise Banks’ point of view, yet not neglecting the macro view on how the rest of the world handles the problem. It showed how different people, different countries communicate and derive messages from the unknown. Some tried to do the “Independence Day” way, being hostile and launch attacks despite not knowing the aliens’ intention. Some countries are the follower, doing what the big powers say. One aspect that had me in awe was how Director Denis Villeneuve brought across the complex concept of human memory trigger (object and sensory association) in a clear cut way without trying to be too philosophical. The story and messages challenge the viewer to think, to guess, and it ask questions about communication, humanity, society and even romance, getting the audience to talk about it. However, this movie is not for you if you are going for something loud, brainless, and maybe adrenaline pumping action. It is not for you if you entered the cinema to go on a fantasy adventure with the cast. It is definitely not for you want to be horrified by some CGI-heavy aliens and have them snaring their teeth at you. Arrival is something special, something personal, something emotionally beautiful. This refreshing film made me want to say #ThanksForBeingHere rather than #WhyAreTheyHere. Arrival Movie is based on the 1998 short story “Story of Your Life” by Ted Chiang. In the novella, “Stories of Your Life” by Ted Chiang, nine “looking glasses” arrive in America, a total of 112 worldwide. The film reduces that number and alters the dimensions to more profound effect. The inky circular alien language was created by Montreal artist Martine Bertrand. It is also the artist’s son who created Hannah’s drawings. A fully functioning, visual, alien language was created for the movie. Heisserer, Vermette and their teams managed to create a “logogram bible,” which included over a hundred different completely operative logo-grams, seventy-one of which are actually featured in the movie. Director Denis Villeneuve and the writing team took extensive efforts to ensure the movie’s scientific ideology was accurate. Renowned scientist and tech innovator Stephen Wolfram and his son Christopher Wolfram were consulted to ensure all terminology, graphics and depictions were sound. The helmets worn are respiratory protection units manufactured by Sundstrom, which are widely used in industry. This movie reunites American Hustle (2013) co-stars Jeremy Renner and Amy Adams. Amy Adams and Jeremy Renner have both appeared in comic book films dealing with alien invasions. Adams starred in Man of Steel (2013) (about Earth being invaded by evil Kryptonians). Renner starred in The Avengers (2012) (about Earth being invaded by the aliens known as Chitauri). The heptapod’s craft owes its design to an asteroid called 15 Eunomia. During research, director Denis Villeneuve became attracted to Eunomia’s “insane shape like a strange egg” and thought that kind of pebble or oval shape would bring a perfect sense of menace and mystery to the spacecraft. Octopuses, whales, elephants, and spiders were all sources of inspiration when it came to creating the aliens, Abbott and Costello. Director Denis Villeneuve wanted their design to evoke a very strong presence, an air of intelligence, and the feeling of being close to a “huge beast underwater.” He also wanted the aliens to feel like something you might imagine in a surreal dream or nightmare and, in the later stages of the film, he wanted them to be suggestive of the Grim Reaper. Check out Arrival Movie Official Website and Facebook Page! Arrival Movie is out in Singapore cinemas on 12 January 2017. *Disclosure: No monetary compensation was received for the movie review. Invitation by Sony Pictures. Whoah, I jsut watched the trailer and boy, it is something worth watching, indeed! It looks like the independence day movie but sure it that people have something to look forward in this film. I am quite excited about it. The other day while watching passengers, saw the trailor of Arrival. Found it quite intriguing. After reading this review, looks like not to be missed. I rarely follow movies now but arrival looks really interesting. I’ll check this out. I heard many good reviews about this movie as well. l am going to watch it this weekend. I think i might like this movie. While the movie deals with alien invasion, of its main story line is about human emotions, I might like it!